Back in 1951 Gerd Hay-Edie received a letter from the highly acclaimed designer, Robin Day. In it he said, “Of all the rugs which I have seen, only yours have got the character enough as a background for my new designs of furniture to be exhibited at ‘La Triennale de Milano 1951’. Please can you weave for this Exhibition a rug of the approximate size: nine feet by seven feet…” The three rugs exhibited went on to win a silver award and were the start of a long and satisfying working relationship between Hay-Edie and The Days. With such an interesting story behind the previous collaboration between Hay-Edie and Day dating back to the 50’s we were very excited to hear that Mourne Textiles has been chosen by Margaret Howell CBE, to produce one of Hay-Edie’s own designs from the 1950’s after one of our favourite British shops twentytwentyone commissioned ten of the country’s foremost designers (see our list below) to pick ten textiles to cover special editions of Robin Day’s Reclining chair (1952). “The challenge for the designers was to specify upholstery which appealed to their personal design criteria and resonated with the chair’s original spirit and character. To choose a textile that could draw a smile from Robin. It has proved to be no easy task, but the results are an enlightening union of classic and contemporary” says Simon Alderson from twentytwentyone. Gerd Hay-Edie, a Norwegian born textile designer, settled in Ireland with her English husband in 1947. Having already travelled extensively with her craft, she studied design and hand weaving at the Home Industries School for Women in Oslo and spent time in England and Europe, by which time she was becoming well-known for her pioneering methods within the textile industry. She learnt to weave on hand looms with hand twisted yarns in China and completed a commission of 22 hand-woven rugs for the Palace of the Maharajah of Gwalior in Calcutta. These experiences helped to shape the direction she took with her weaving and made her famous around the world. Her exquisite, bespoke range of fabrics for rugs, upholstery and later on tweeds were commissioned by both designers and fashion designers alike. 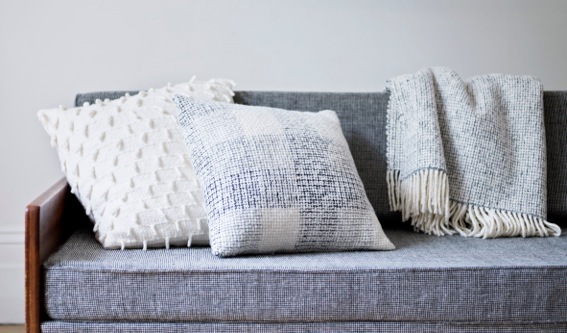 She worked with Robin Day, Terence Conran, Sybil Connolly and Sheila Mullally whipping up bespoke, iconic textiles from her tiny workshop at the foot of the Mourne mountains in Ireland. Daughter, Karen Hay-Edie, brought up on the loom and influenced by her mother’s knowledge and technical abilities was happy to follow in her mother’s footsteps, becoming a master weaver herself. Years later Gerd’s grandson, Mario Sierra, is also carrying on the tradition, having developed a passion and fascination for weaving and design at a young age, guided by these two inspirational women in his life. His daughters although too young at the moment, are already showing a keen aptitude to keep the family tradition growing having made their own rugs in the workshop in Ireland where it all began. See our previous feature showing photos of the whole family weaving here. Head to their studio via our very own Modern Marketplace and check out their sumptuous midcentury-influenced fabrics, still as collectable as ever. 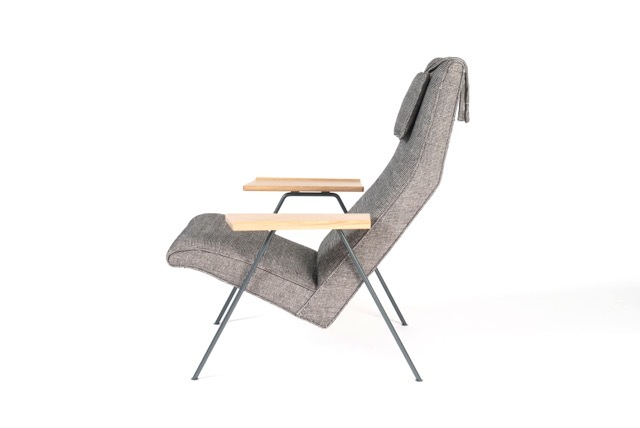 “The Reclining chair from 1952 is a significant Robin Day design that reflects key attributes seen in much of his work. The chair offers high comfort levels, through his understanding for ergonomics. The structure is clearly defined through an exposed frame and composition of elements. The design has a defined personality through its economy of form and the wide sculptural wood armrests. 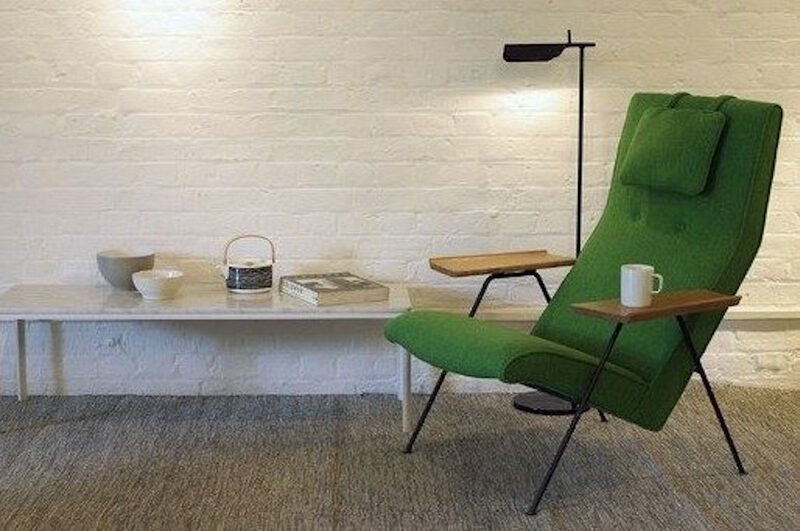 The Reclining chair is an enduring design with classic status.” Simon Alderson from twentytwentyone. The Reclining Chair Centenary Edition will be launched on 1st July. All ten design options will be on show at the twentytwentyone showrooms for one week and will be available to order to the designer’s specification. Produced by twentytwentyone in the UK, The Reclining Chair Centenary Edition is licensed and endorsed by the Robin and Lucienne Day Foundation. “Robin Day was formative in the British adoption of modern design. His extensive work in the postwar era embraced domestic and commercial environments, and thus influenced the interiors people both lived and worked within. He created landmarks in furniture design that remain relevant over fifty years later. He was an incredibly talented, prolific and committed designer, and one of a handful of international greats from the twentieth century. We can be proud to say he was British.” Simon Alderson at twentytwentyone. 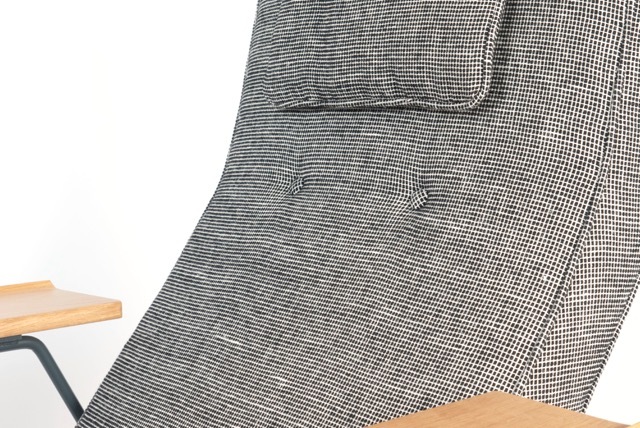 White Noise, 100% British Wool. “I first met Robin at his very elegant house in Cheyne walk. One of the first things he did when we got there, at about 5pm was offer us a very large whisky, he then told us he was feeling sad about not being able to take part in his annual trek across ice and snow in mid winter in Norway because his hip was giving him jip, he was just past his 78th birthday. He was a bon vivuer and had great energy. Written by: Tanya Pateman, Modern Shows®/11 June 2015. Please Note: This feature and all the written content within it belongs to Modern Shows®. If you would like to reproduce any part of the piece or syndicate the feature in full, please contact lucy@modernshows.com and for images, see below.